Composer and pianist; born at Groningen, Holland, June 4, 1829; died in London, June 20, 1869. 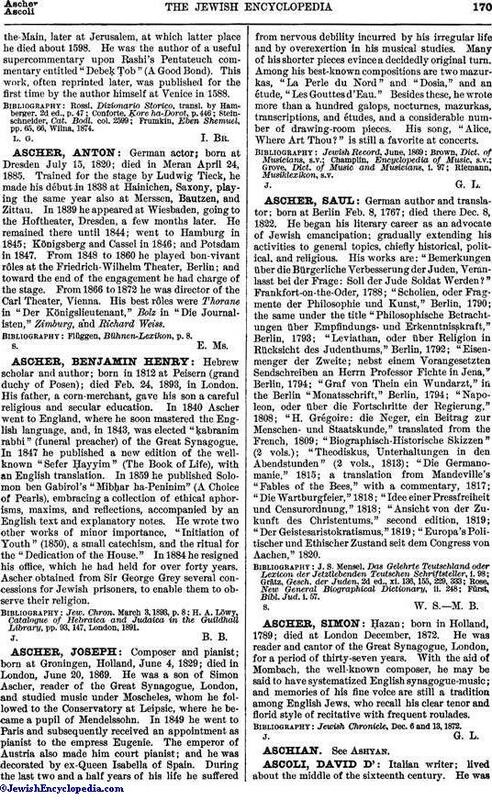 He was a son of Simon Ascher, reader of the Great Synagogue, London, and studied music under Moscheles, whom he followed to the Conservatory at Leipsic, where he became a pupil of Mendelssohn. In 1849 he went to Paris and subsequently received an appointment as pianist to the empress Eugenie. The emperor of Austria also made him court pianist; and he was decorated by ex-Queen Isabella of Spain. During the last two and a half years of his life he suffered from nervous debility incurred by his irregular life and by overexertion in his musical studies. Many of his shorter pieces evince a decidedly original turn. Among his best-known compositions are two mazurkas, "La Perle du Nord" and "Dosia," and an étude, "Les Gouttes d'Eau." Besides these, he wrote more than a hundred galops, nocturnes, mazurkas, transcriptions, and études, and a considerable number of drawing-room pieces. His song, "Alice, Where Art Thou?" is still a favorite at concerts.